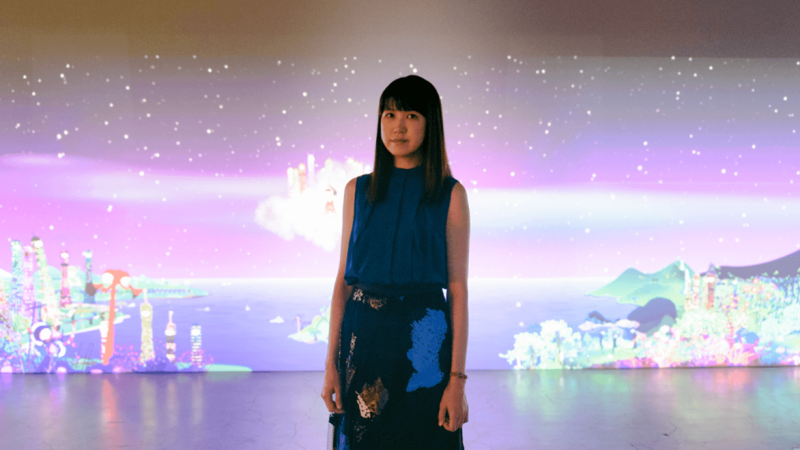 Chiho Aoshima is one of Japan’s leading pop artists, whose work bridges to gap between traditional Japanese painting and modern technology. Aoshima was born in Tokyo in 1974. She graduated from Hosei University with a degree in economics but she wasn’t interested in her studies and took a variety of part time jobs after graduation. One of Aoshima’s jobs was in the graphic design department of a company. 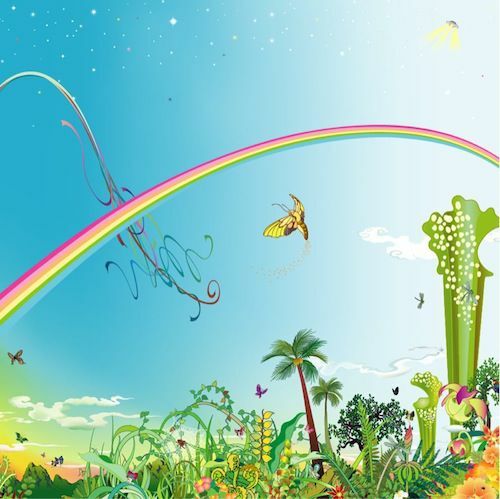 It was there that Aoshima was taught some basic techniques on Adobe Illustrator which inspired her to produce her own art work. Aoshima got a job with Takashi Murakami, founder of Kaikai Kiki Company, which manages and nurtures young artists and gives them venues in which to display their work. The company has offices in Tokyo and New York as well as affiliates in Berlin and Taiwan. 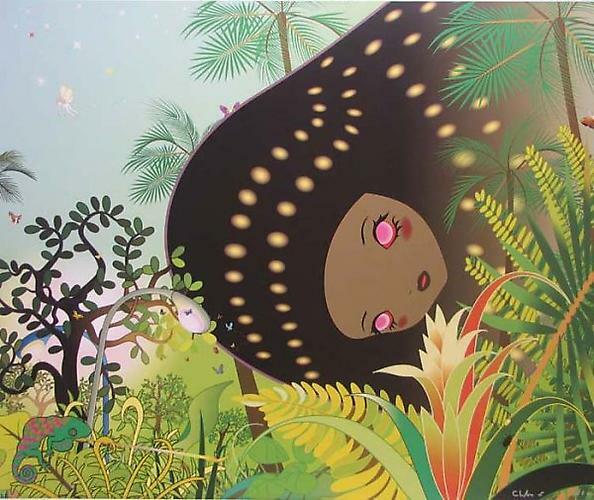 It was Murakami who took an interest in Aoshima’s art and invited her to participate in a group exhibition featuring female artists. Her career took off from there and she has had both solo and group exhibits in Japan, Taiwan, the U.S., Canada and Europe for nearly twenty years. 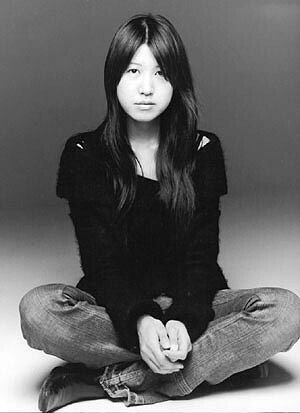 She has also created commercial and graphics for fashion designer Issey Miyake. In 2006, Aoshima was artist-in-residence at Art Pace in San Antonio, Texas. Aoshima says she was influenced by ukiyo-e, the genre of Japanese art that flourished from the 17th through 19th centuries in Japan. Ukiyo-e, meaning picture of the floating world, were mainly prints done on woodblocks. The subjects were most often stylized portraits of women and land and seascapes. 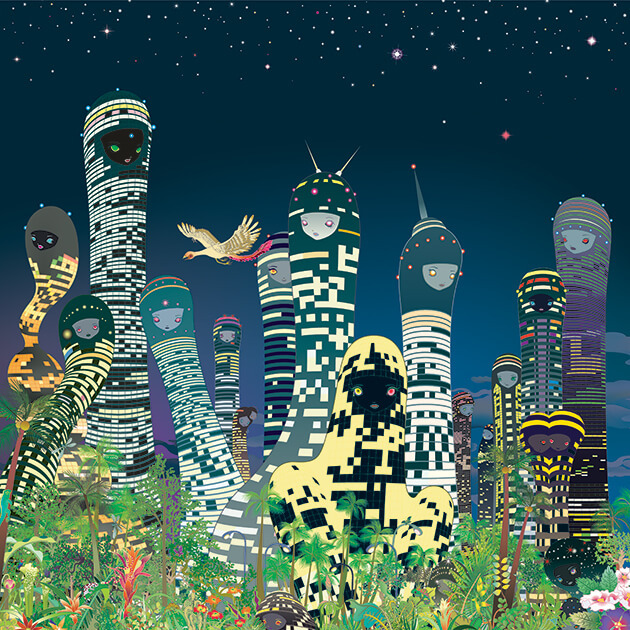 What Aoshima creates with her computer techniques fit into the style that Murakami termed Superflat. 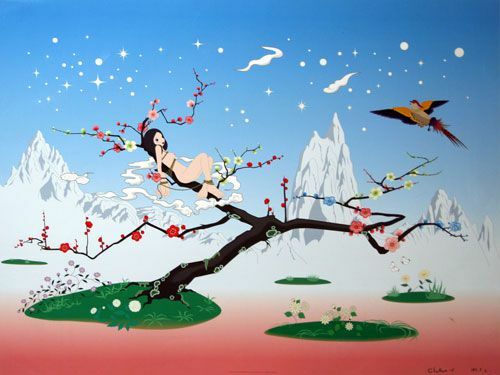 Unlike western artists, who often aim for the appearance of three dimensions in their work, the Superflat, two-dimensional appearance of the work of Japanese artists is a continuance of Japan’s artistic legacy. In 2000, Murakami curated a show called Superflat at the Museum of Contemporary Art, Los Angeles. He invited Aoshima to exhibit work in the show. The Superflat exhibit inspired her to create large scale computer generated works that have led to large murals, videos and sculpture. 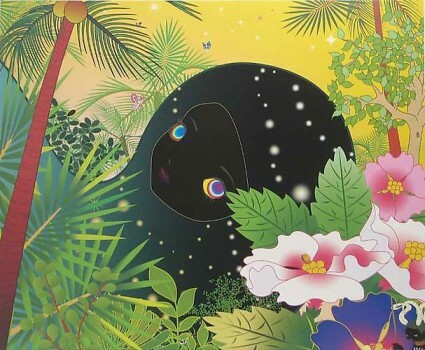 The themes that Aoshima depicts in her art often deal with the clashes between nature and civilization, creation and destruction and life and death. 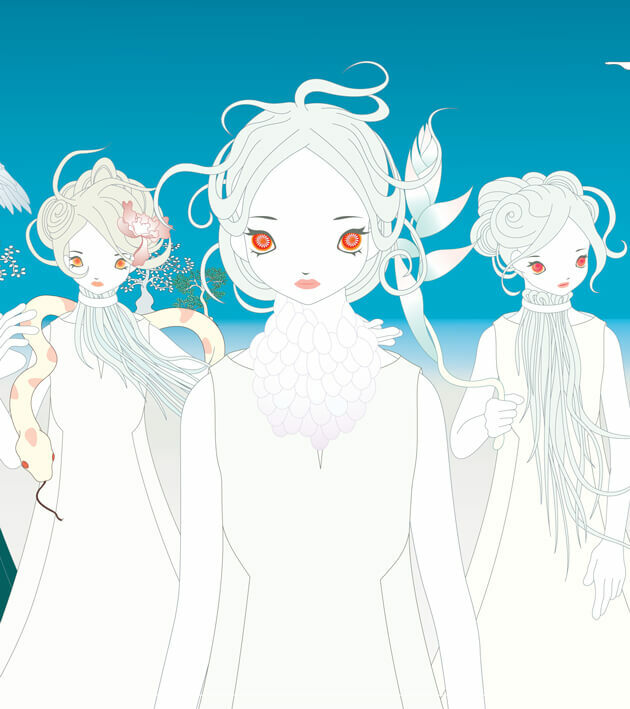 The art shown in her 2016 Rebirth of the World exhibit was created after the devastating 2011 earthquake and tsunami in Tohoku and focused in the theme of destruction and rebuilding. The show was done in collaboration with New Zealand animator Bruce Ferguson. Rebirth of the World is an interactive exhibit that uses game engine technology to detect the arrival of viewers which triggers the animated characters to come to life. Please contact us for more information about Building Head-Chameleon, Japanese Apricot or any of the works of Chiho Aomisha for sale at VFA. Digital Inkjet Print, 19 5/8 x 138 in., Seattle Art Museum, Gift of the Contemporary Art Project, Seattle, 2002.6. 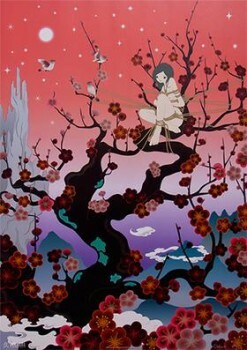 © 2000 Chiho Aoshima/Kaikai Kiki co., ltd. All Rights Reserved. 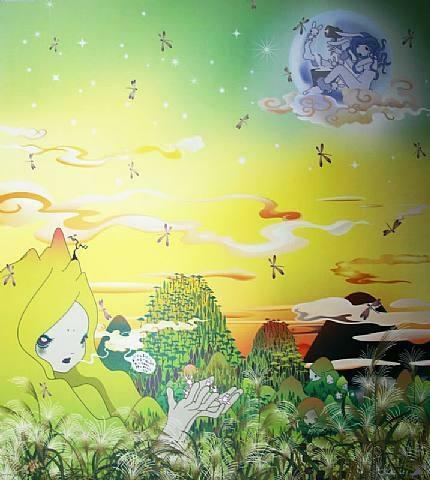 Chromogenic Print, 66 15/16 × 66 15/16 in., courtesy Blum & Poe, Los Angeles/Galerie Perrotin, © 2005 Chiho Aoshima/Kaikai Kiki Co., ltd. All Rights Reserved. The magic of Chiho Aoshima’s work lies in her ability to create dreamscapes that appeal to a universal sensibility. Born in Tokyo in 1974, Aoshima graduated from Hosei University with a degree in economics and found that she had a desire to create art, rather than work in finance.